Certainly Ford doesn't dress his characters in white and black hats, and he lavishes as much attention on the ample downtime of life in a frontier town as he does on the action, but “My Darling Clementine” functions just fine as an exemplar of genre convention. In retelling the already familiar (even by 1946) story of the Earps' and the Clantons' showdown at the OK Corral, Ford and screenwriters Winston Miller and Samuel G. Engel are quite content to embrace myth and audience-friendly cliché. Wyatt Earp (Henry Fonda) is a tough, no-nonsense man of honor; the Clantons (led by Walter Brennan as clan patriarch) are low-down cattle rustlers and cowardly murderers. Indians are drunks, women are a pretty nuisance, and the good guys beat the bad guys. As many have noted, Ford chose to print the legend as told by Earp (in some cases as told directly to Ford, who knew Earp in the icon's latter Hollywood years) and displayed no apparent interest in the shadings of messy reality. No mention is made of Earp's political ambitions (the showdown at the OK Corral was caused in part by Earp's desire to be elected county sheriff) or the fact that lawman was only an occasional gig for a drifter who was substantially more interested in gambling and took up an odd array of jobs from land speculator to boxing referee. Ford and his team were more interested in pleasing viewers than in upending genre conventions, as evidenced by the fact that Ford acquiesced to a substantial re-edit by producer Darryl F. Zanuck who tightened the pacing and tweaked the ending (boy kisses girl, darn it!) after an early audience test screening. 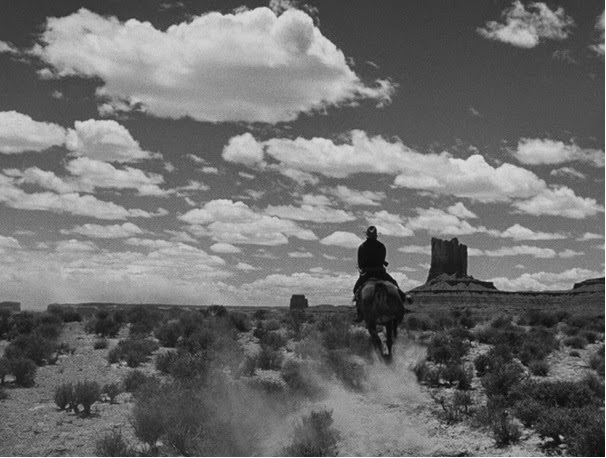 The film's meticulous attention to detail, its laconic pacing, and the immaculate compositions by cinematographer Joseph MacDonald (exploiting Ford's beloved Monument Valley) are what primarily set it apart from its more mundane peers, not any revolutionary content. Ford was a master craftsman who always seemed to know exactly where to place the camera and how to best deploy his casts' talents. 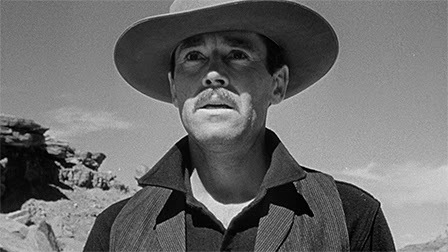 Henry Fonda was always better at seeming indignant and aloof than giving the audience access to his inner life, and those qualities are used to great effect here. Earp is ostensibly motivated by grief over the murder of younger brother James by the Clantons (another invention for the film), only accepting the job as Tombstone's marshal so he can bring the outlaws to justice. But Fonda hardly seems choked up by the loss; he's more disgusted with both the town and the townsfolk, even Doc Holliday (Victor Mature, there mostly to look hunky) whom he befriends but constantly judges. If Wyatt seems relaxed while kicking back in his chair and watching the tumbleweeds roll by it's mostly because he can't really be bothered to get involved until lovely Clementine (Cathy Downs) arrives on the scene. As a true outsider like him, she represents a reflection of sorts and his only potential match in all of Cochise County. Too bad she's Doc Holliday's gal. Like most of Ford's best films, “My Darling Clementine” offers its share of small but distinct pleasures. Walter Brennan doesn't say the word “Marshallin'!” so much as he spits it all brown and gooey into a rusting cuspidor; it's almost enough to make you forgive Ford for casting the beloved sidekick as a baddie. When brother Virgil Earp (cowboy star Tim Holt) notes that a Sunday morning smells like sweet honeysuckle that reminds him of home, freshly-shaved Wyatt dispels the poetic fancy, “It's me. Barber.” And, of course, there's that oft-mentioned stagecoach that suddenly splits the screen during the final gunfight, kicking up perhaps the most cinematic cloud of dust of all-time. The film is so rich we can choose our own counter-reading today. 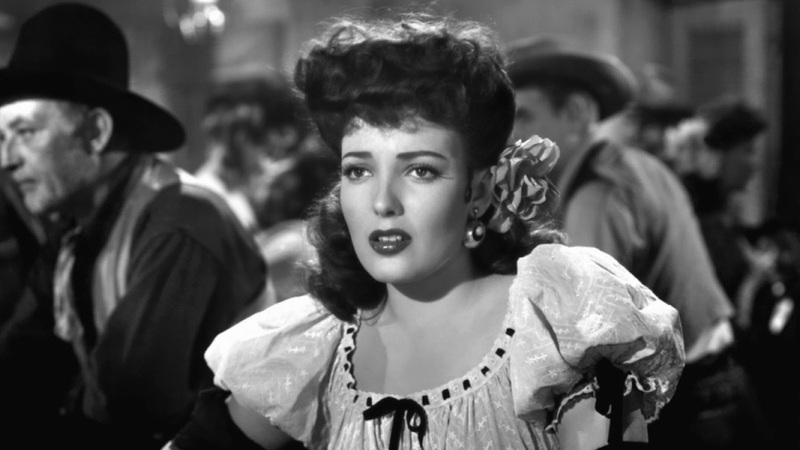 Earp's public humiliation of the drunk Indian Charlie coded him as a hero in 1946, but plays as cruelly racist today, a perfect match for the casual sexism on display when he drags Mexican bar singer Chihuahua (Linda Darnell) into an alley and drops her in a trough of water. She annoyed him, after all. Indeed, viewers today could adapt poor, unfortunately named Chihuahua as their main point of identification. Buffeted by the selfish caprice of boyfriend Doc Holliday and authoritarian rule of macho Wyatt Earp, she does her best to play a game with the deck stacked against her. It would help if Darnell was a little more convincing in the role, but Chihuahua's a damned sight more sympathetic than our would-be heroes. I seriously doubt that was Ford's intention, but maybe this really is an anti-Western after all. The film is presented in its original 1.33:1 aspect ratio. The 1080p transfer, sourced from a 35 mm nitrate composite fine-grain print, isn't quite as razor sharp as most of Criterion's high-def transfers, but it's still quite beautiful. Black-and-white contrast is strong but not remarkable and it's possible some of the detail in darker scenes required a bit of boosting. Grain structure isn't quite as rich as it could be either, but still noticeable and pleasing. Solid, but not elite. The linear PCM mono audio mix is clear and surprisingly resonant. The title track as well as other music by Cyril Mockridge comes off very well in this mix. Optional English subtitles support the English audio. 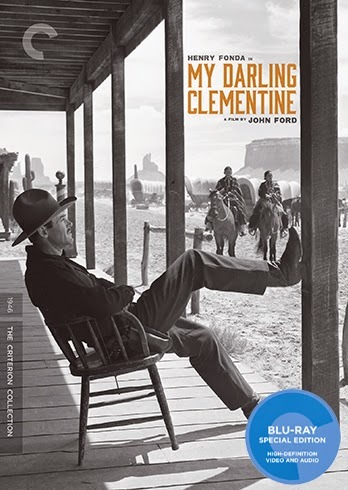 The major highlight of this Criterion release is the inclusion of “Pre-Release Version” of “My Darling Clementine.” Criterion points out that this is not the original cut by Ford (that may be lost for good), but rather an intermediate version that was screened in July 1946, three months before the theatrical release. This cut runs 103 minutes – producer Darryl Zanuck would lop off another six minutes for the theatrical cut. It was copied from a nitrate print and has not been fully restored; there was a decent amount of damage (lots of speckles) on the ten minutes I sampled but the photography still looks sharp and it is in high-definition. If you don't have 103 minutes to watch another cut of the film, Criterion has also included a “Version Comparison.” Preservationist Robert Gitt of the UCLA Film and Television Archive discusses his work on both versions of the film and the differences between the cuts. Unfortunately this isn't a major time-saver either, running a hefty 42 minutes but it's certainly packed with information. Criterion lists this feature as being recorded in 2004 but since its was included (along with the Pre-Release Version) on 20th Century Fox's DVD release in January 2004 (and reviewed by our own John Puccio in December 2003) I'm guessing that's a year off. “Print the Legend” is a 14-minute interview with scholar Andrew C. Isenberg, author of “Wyatt Earp: A Vigilante Life.” Isenberg discusses the true story of Wyatt Earp which has so little to do with the film version it's like hearing an entirely new story. I knew a lot of it, but didn't realize that the gunfight in Tombstone was big time national news in 1881. This is an excellent feature. The disc also includes two brief television segments. An excerpt (7 min.) from the April 15, 1963 episode of NBC's “David Brinkley Journal” provides a brief history of Tombstone, AZ while an excerpt (5 min.) from the Sep 28, 1973 broadcast of “Today” discusses Monument Valley, briefly touching on its use in films like John Ford's. “Lost and Gone Forever” (18 min.) is a 2014 visual essay by film and John Ford scholar Tag Gallagher. I've greatly enjoyed Gallagher's visual essays on previous Criterion releases, but I felt he was straining a bit here to emphasize the film's groundbreaking qualities and its alleged darkness over its more generic pleasures. “Bandit's War” (14 min.) is a 1916 short film directed by and starring Francis Ford, older brother of John Ford. It's a comedy Western about an outlaw who tries to get a very righteous woman to kiss him. A young, eyepatch-less John Ford plays a supporting role. Ford appeared in a few dozen comedy shorts but after 1917 turned his focus behind the camera. We also get an audio recording of the Apr 28, 1947 episode of “Lux Radio Theater” (58 min.) featuring a condensed performance of “My Darling Clementine” starring Fonda and Cathy Downs. The slim fold-out booklet includes an essay by critic David Jenkins. Maybe I don't love “My Darling Clementine” quite as much as some of Ford's other celebrated Westerns. I'd put it behind “The Searchers,” “Stagecoach,” and the entire Cavalry trilogy. But it's still mighty fine. This Criterion release is jam-packed with extras, including a whole different cut of the film and should keep fan both busy and happy.